Tuesday was the day that U.S. Rep. John Lewis (D-Ga.) and other Democrats went back to Congress to figure out what to do next on gun control. Speaker of the House Paul Ryan said that afternoon that he wasn’t going to reward Democrats for their civil obedience. Honestly, when Lewis, the last survivor from the 1963 March on Washington’s speakers platform, led that 26-hour sit-in on the House floor, I was intrigued and excited, but as the day went on, it did breeze through my mind that the old man was losing it. Why would this civil rights leader-turned-liberal lion use his hard-won movement cred for the one-gazillionth time in this semiorganized way? This protest seemed as ad hoc as some sort of activist space cruiser left adrift without hyper drive. Ryan, part of a new generation of whites who've been exposed to the movement history that Lewis and others wrote in blood a half-century ago, understood that movements need open resistance to stay alive. So, although visibly annoyed, Ryan was smart enough to step out of the way: He turned off the House’s lights and cameras, leaving the sit-in protesters to Periscope and Facebook. But Lewis got what he wanted: Buzzing commenced. In retrospect, I was excited that someone had taken over the House, but I was disappointed by who. My almost quarter-century living in the Washington, D.C., area showed me, sadly, that the spirit of Che Guevara did not exactly thrive in the Congress—or in corporate downtown white Washington, D.C., bougie black D.C., or now-gentrified white D.C., either. The party determined to elect Hillary Clinton this fall is in no way the hope of radical, or even substantial, social change. Tearing through all three volumes of John Lewis’ “graphic memoir,” March (the third and final volume will be published next month), I saw that the Democratic Party really hadn’t changed a bit. But I also got some clues as to the “why” of Lewis. Lewis and his co-writer, Andrew Aydin, joined by artist Nate Powell, spill the bloodstained ink of a vicious history all over the more than 500 pages of the three volumes. Much of the 1955-1965 history is familiar to anyone who’s seen a movement documentary or docudrama: the Freedom Rides, the Birmingham, Ala., church bombing, the Selma-to-Montgomery, Ala., march. It will come as no surprise to those who read these types of post-2010, black narrative-history books that Lewis’ testimony is bookended, and fulfilled, by Barack Obama’s 2009 inauguration. The movement veteran does a great service by mentioning all of the people who were murdered on his watch who are not remembered by American history’s ever-shrinking popular summary. The fact that a vibrant, courageous life can, and often did, end in a disturbing death haunts his work. Lewis and his colleagues in the Student Nonviolent Coordinating Committee understood that they could be violently erased at any moment. They courted the Grim Reaper because they saw that risk as the only way to change the psychological and spiritual sickness of white supremacy and white indifference from the segregated outhouse to the segregated White House. What was most significant about March was its attempt not at visuals but at sound. The trio of creators want the reader to hear spitting sheriffs, marching heels, flashing camera bulbs and ringing phones. Although in black-and-white (symbolically? ), the volume wants the young people of tomorrow’s movements to experience both the sudden trauma and the little, quiet moments. March is mandatory reading for any teen or preteen, but I would strongly suggest that it be paired with Herb Boyd and Lance Tooks' contribution to the For Beginners documentary comic book series, Black Panthers for Beginners. Lewis’ black Christian liberal worldview of black nationalism and Pan-Africanism, of Stokely Carmichael, of Malcolm X, needs to be supplemented and countered. 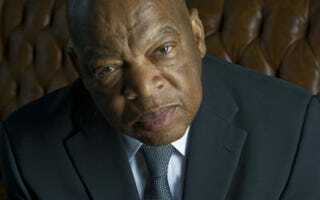 John Lewis is unquestionably an African-American hero. But as a Northerner who is a strong admirer of the black power movement, especially the 50-year-old Black Panthers, I feel he’s also like black America’s older, slightly annoying great-uncle who still thinks platform shoes and the O’Jays are cool. Does Lewis, now 76, live waaaay too much in the interracial, supposedly harmonious past of pre-black-power-movement activism (a depiction as unreal as, well, movement comic books), or does he see a future in which black-led justice will be permanently linked with other struggles? Clearly both; from his perspective, he has no choice. And movement people believe in doing, in taking substantive risks—and generating armchair criticism from those not in the arena, like me. So the Last Speaker, the doer, moves, repping (and, frankly, perhaps sometimes taking full advantage of) his painful witness with his own very moral sense of struggle and justice. What was clear about the House sit-in was this: He tried to act against a brooding evil that had spilled innocent blood once too often. When put in those terms, election-year Democratic liberal stunt or not, Lewis had no choice but to fulfill his whole self, to try to bear witness before the latest shooting victims would be added to the historical limbo of the forgotten. Whatever you think of Lewis, Capitol Hill has seen motivations far less pure.